Hi everyone! Where on earth did July go? I thought it was just here and we were just celebrating Eid and now we’re already in August and duit raya is already gone. This is saddening. Time flies in a blink of an eye and I’m pretty sure 2017 is coming rather swiftly. Trust me on this. I have a few things to talk about in my July favourites so I hope you’ll enjoy this post! 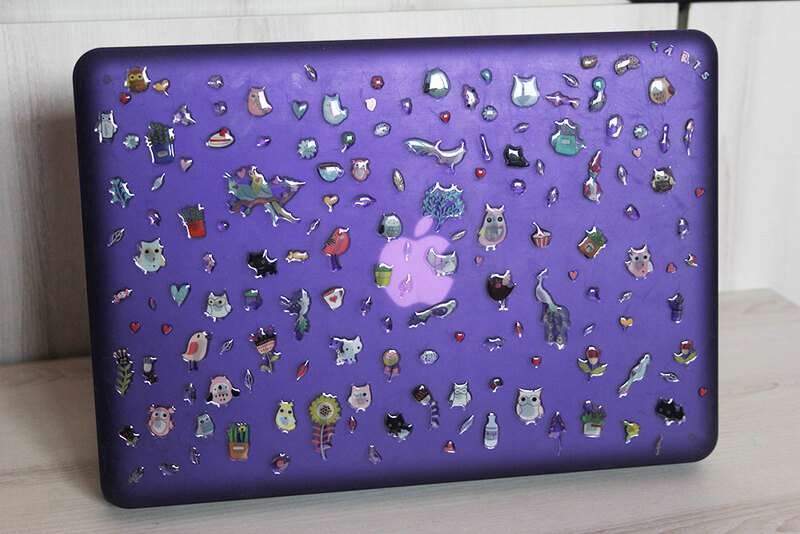 I got this purple Speck case for my laptop back in 2013 and I have so many scratches on it already from 24/7 of using my laptop. I thought I would revamp it with stickers I got from Mr. DIY at Tesco. They have assortments of cute stickers you will go bananas from wanting to buy everything. I’m a hoarder so I bought a lot of them. I used a few packs to decorate my casing and they’re very cute! A few weeks ago I bought Azanis Scar Serum for my hyperpigmentation and I am so happy with the product. My scars haven’t cleared up yet but as soon as they have, I will do an in-depth review about it on my blog. I’ve only been using it for about two weeks and so far I have seen positive changes on my skin. My lip product of the month is NYX Soft Matte Lip Cream in San Paulo. That shade suits my skin colour perfectly. It is my go-to colour and I will definitely repurchase it. Another favourite is my black leather watch from GUESS. I stopped using it last year because it ran out of battery and I was just lazy to get it changed but I did a few days ago and I have been using it everyday. I took the time to colour coordinate my scarf and I found Zawara Luna Glitter Shawl in cream. At first, I thought I wasn’t going to like it because it’s made of heavy lycra. I do not like heavy lycra because it makes my already huge head even bigger but I was wrong! I love this shawl. It doesn’t move around at all. Too bad I couldn’t include it in the picture because it’s in the wash. I love this purple journal my boyfriend got me last Sunday. He bought me one last year in Turkey and I have used all of the pages so I needed a new one badly. It feels so good being able to write again. Everyone knows the important of drinking enough water everyday but sometimes we forgot or lose track of the amount of water we drink. I use Water Drink Reminder app to keep track of my fluid intake and also to remind me to drink water every hour.